Heard these jokes about Jewish mothers? Q: Why aren’t there any Jewish mothers on parole boards? A: They’d never let anyone finish a sentence. Q: What did the waiter ask the group of Jewish mothers? The forgotten saint of the anti-apartheid movement, her legacy to liberalism was to abandon the armchair. … For an astonishing 36 years Suzman was a flickering flame of white conscience in apartheid South Africa. For 13 of those years she carried that light alone, a one-woman party in a parliamentary sanctum of hostile men. While some came to admire her, most loathed her, and tried to drive her from their presence. They jeered her interventions with sexist, antisemitic, domineering abuse. The anti-apartheid activist Helen Joseph wrote that “even house arrest” must have been less lonely. Suzman’s resistance must be among the most courageous parliamentary careers ever. 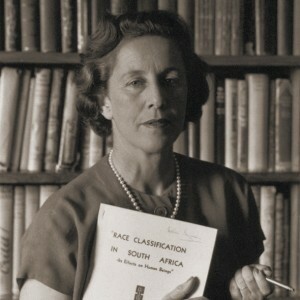 Anger… perpetually furious… never compromised… perpetual rage… But I think something’s missing: the word “hate.” I doubt that Helen Suzman was motivated by love of Blacks, but those “dreadful anti-Afrikaner jokes” probably reflected her true feelings about White Christian South Africans. Would she have campaigned as intensely against Israeli injustices against Palestinians? I think not. In the end, she got what she wanted: White South Africa was overthrown and Suzman’s dear friend Nelson Mandela became president. That other formerly former White-minority governed country, Zimbabwe (see also here), is a political and economic disaster on an even bigger scale, and sooner or later South Africa will surpass it. That is what Helen Suzman’s verbal aggression and self-righteousness helped to create in South Africa. You don’t have to look far in America and Europe to find similarly aggressive and self-righteous liberals demanding that all White nations abolish themselves as South Africa did. The results will be the same: civilization will be replaced by barbarism.